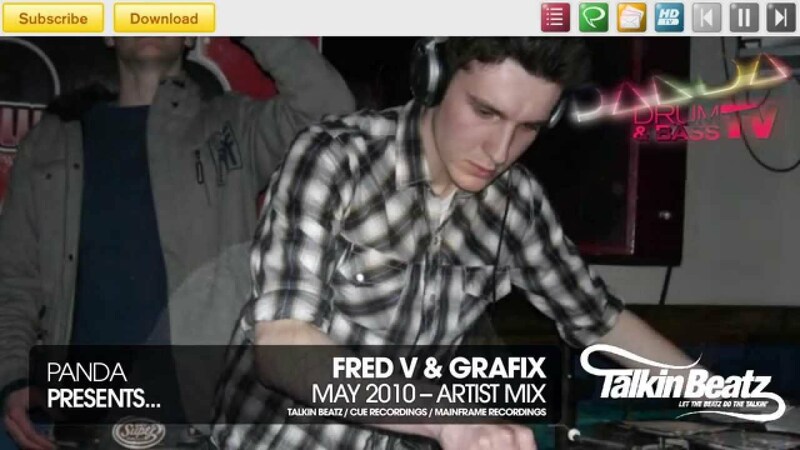 Panda presents Fred V and Grafix. The production duo from the UK's Southwest have been on a roll this year and are quickly becoming some of the hottest property in liquid Drum & Bass. Their music has already been on rotation by Grooverider, Danny Byrd, D Minds, Brookes Brothers, Crissy Criss, Netsky, Mutated Forms and KG and on BBC Radio One and BBC 1Xtra. Their vibrant and sparkling liquid tunes are finally being released on KG's Talkin Beatz, Cue Recordings and Mainframe Recordings. Forthcoming from the duo now are "One of These Days" and "White Lies" in addition to Fred V's "Remember to Live" and Grafix's "Take Your Time" which will be out soon too. Fred V is one of the UK's leading up and coming Drum N Bass producers. At only 20 years old, Fred's music has already gained regular support from some of the scene's leading DJ's including Grooverider (BBC Radio 1), Danny Byrd (Hospital Records), Netsky, Mutated Forms, KG, Nerm and D:Code (BBC Radio 1/Asian Network), and Crissy Criss (BBC 1Xtra) and with track's and remixes forthcoming on labels like Talkin Beatz, Ape Music, All Street recordings and Bassdrive Tunes, Fred V shows no sign of slowing down. A series of hot gigs across the Southwest also earned him a nomination as Best Southwest DJ at the 2009 Southwest Drum & Bass Awards. Grafix originates from from Exeter in Devon and studies music production at Bath Spa University, and has been producing Drum and Bass for several years. Josh's reputation seems to be growing everyday and is recognized as one of the Southwest's leading up and coming producers. Josh has gained radio support from Crissy Criss (BBC 1xtra) and Nerm & D:Code (BBC radio 1/asian network) as well as support from Drum & Bass heavyweights such as Danny Byrd, Distorted Minds, Brookes Brothers, Netsky & Mutated Forms. Grafix has several 12" releases set for 2010, on labels such as Talkin' Beatz and Pristine Records.